A box office slow burner but a critically acclaimed horror, The Babadook is a chilling feature that marks the directorial debut of Australian actor Jennifer Kent (she wrote it too, based on her short film Monster). Amelia is a widowed mother struggling to bring up her young son Sam, who is convinced that the monsters that lurk under his bed are real, leading to insomnia, bizarre behaviour and exclusion from school. 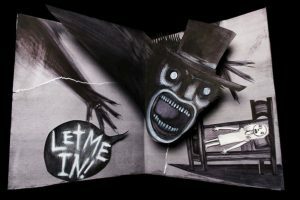 One day a pop-up storybook called Mister Babadook mysteriously appears and is read to Sam as a bed time story by his mother… giving the previously anonymous under-the-bed-monster a name. The Babadook. Best watched without any plot spoilers The Babadook is as-good-as-it-gets horror, preying on our childhood fears while grounding us in the reality of coping as a single parent. Director Jennifer Kent cites David Lynch as her favourite director, the films of John Carpenter and Carl Dreyer as influences, and insists she’d rather watch Saw if it popped up on the TV than an Oscar-winning drama. She didn’t conceive of The Babadook as a horror film though, saying in a Guardian interview at the time of the film’s release that “where horror excels is when it becomes emotional and visceral. It was never about, ‘Oh I wanna scare people.’ Not at all. I wanted to talk about the need to face the darkness in ourselves and in our lives. That was the core idea for me, to take a woman who’d really run away from a terrible situation for many years and have to face it. The horror is really just a byproduct”. And with a gothic feel and a CGI-light production, she certainly got that byproduct. She also got extraordinary performances from Noah Wiseman who plays the six-year-old Sam and Essie Davies, his mother Amelia.